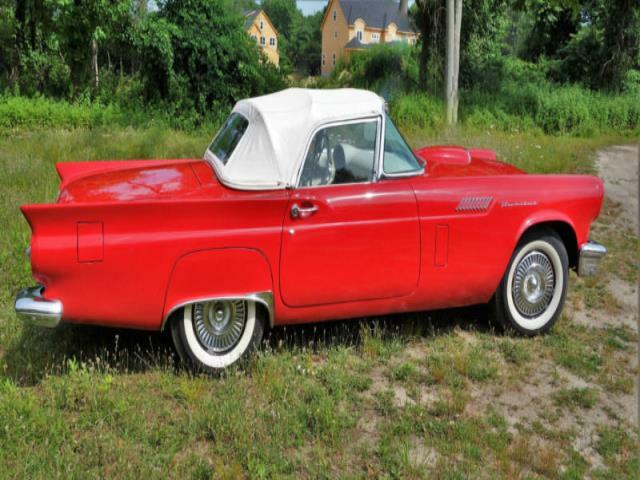 1957 Ford Thunderbird VIN #D7FH394447 Original 312 V8 w/4bbl 245HP / Automatic 3, 000 miles Red Exterior White Vinyl Interior Info A true barn find!!! 1957 Ford Thunderbird Original 312 cu in. 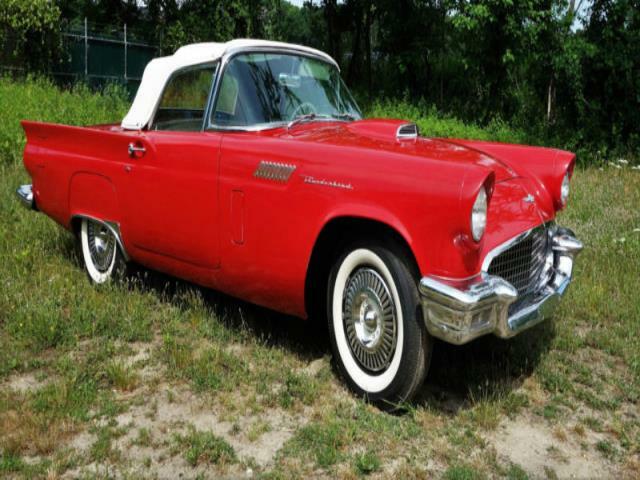 / 245HP, auto trans, power steering, and power brakes, red with white interior and convertible top. Recently removed from dry storage, cleaned up and mechanically overhauled throughout. 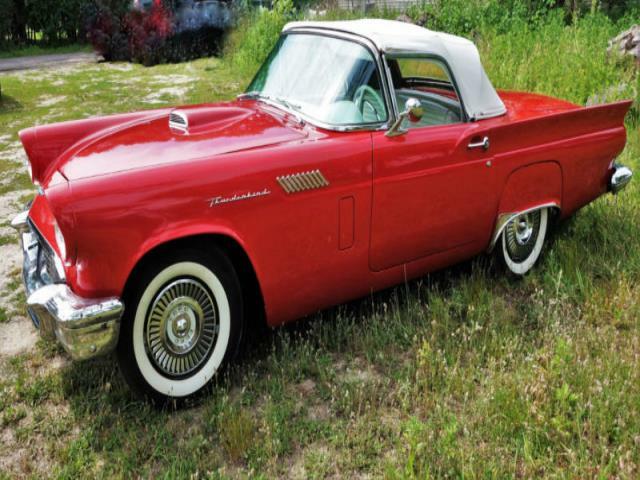 It has a solid frame and body panels... RUNS AND DRIVES EXCELLENT!!! 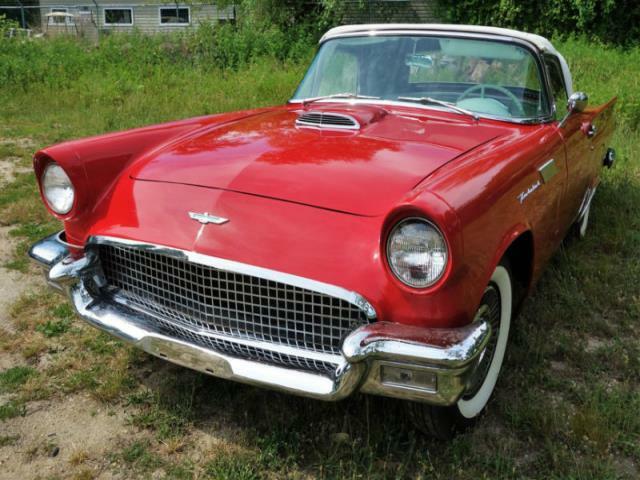 This garage find 1957 Ford Thunderbird is an excellent driver. Inspection sticker is from 1984 and it has been stored in a dry environment since 2004. This is a nice driver with great potential, Driver quality with older paint original chrome. Mechanically gone through and runs great! Major tune up performed, new spark plugs, ignition wires, etc. New gas tank, sending unit, fuel pump, and water pump were installed. Carburetor rebuilt, transmission serviced, all fluids flushed and changed. Complete brake rebuild. New master cylinder, hoses, wheel cylinders, and shoes. Complete new aluminum exhaust system.